Wily Tiles is Orbulon's boss microgame in WarioWare: D.I.Y. The point of this game is to align the numbers one through eight in order on a nine square grid. 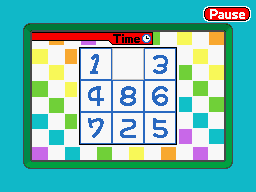 To do this, the player must use the stylus to slide a number into the one open square on the board by tapping on it. The player needs to fill in the top row with the numbers 1, 2, and 3, the middle row with the numbers 4, 5, and 6 and the bottom row with the numbers 7 and 8. The tiles have to be aligned from left to right. The game takes some patience and planning. If the player manages to align the tiles before time runs up, the game is won. However, if time runs out and the player hasn't achieved this, the game ends in a loss. This page was last edited on July 31, 2018, at 12:10.